A wondrous wooden hadrosaurus dinosaur. This wooden dinosaur, type hadrosaurus, is a real piece of handcraft and creativity. It is the favourite wooden toy of many of our employees and their children. By pushing the dinosaur forward, the mouth opens and closes and the legs go up and down automatically without the use of any electronics. Mechanics as they used to make it before batteries and microchips existed. A collector's item for every dinosaur fan (young and old) and a great wooden toy to play with. 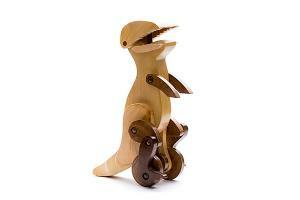 This wooden dinosaur is hand made and produced out of sustainable natural wood. The hadrosaurus suits also perfectly as decoration for your child's room or even your living room. The dinosaur is not only fun to play with but also stimulates the development of the gross and fine motor skills of your child and above all, its fantasy world. Each hadrosaurus is individually branded by the natural grains of the wood and the touch of the craftsman.